Welcome to SilentMode’s 50th review! SilentMode is probably the only one celebrating, but here’s a review of a set actually related to a celebration. 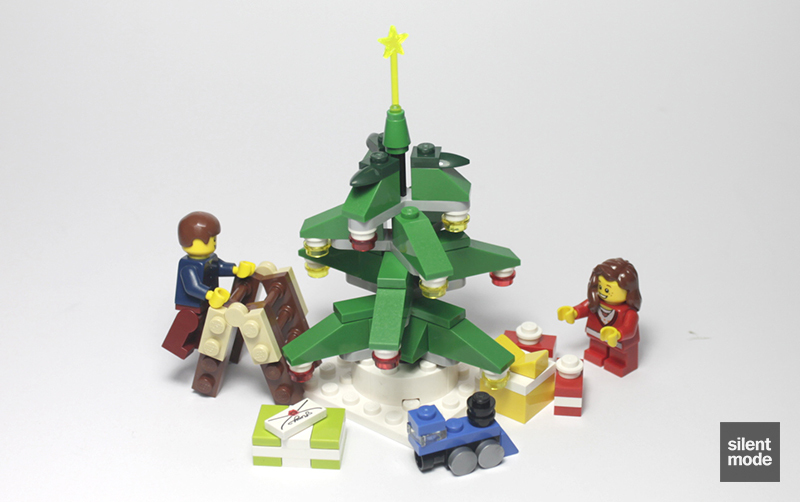 This one is so fresh, the details aren’t even on Brickset – so I will be winging it for now. 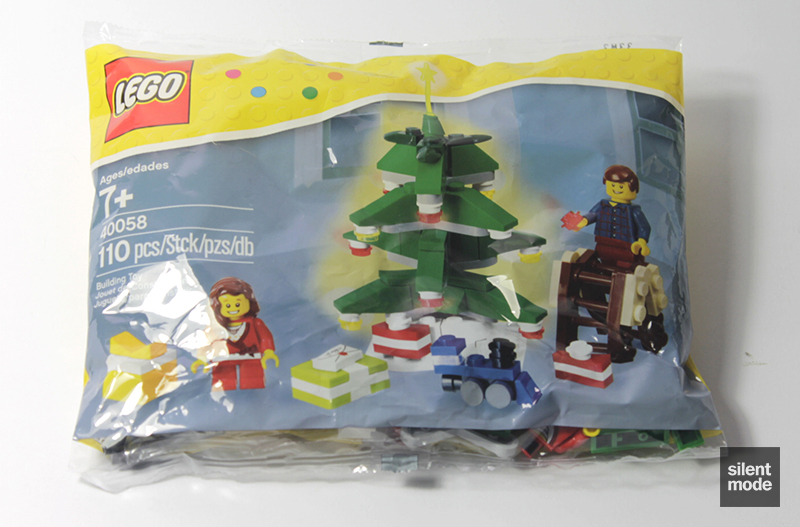 I’d made the assumption that this polybag set was the Winter Scene, as we’ve already had scene sets for the other seasons, as well as a very American Thanksgiving Feast (40056). Then we have to remember: the other seasons were in an outdoor setting. 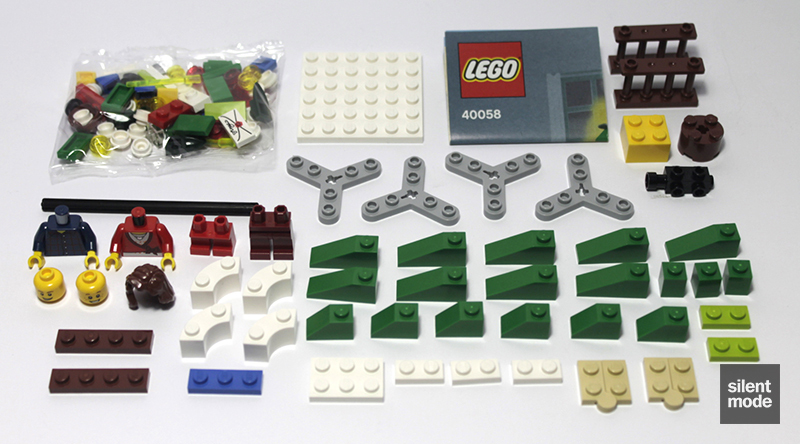 If you’ve gotten these from a LEGO store, you’ll notice the set stands out in a pile of polybags. I like the blue across the front of the polybag, which really pops. The usual warnings in 729 languages adorn the back of the box. Not 728 this time, mind you. 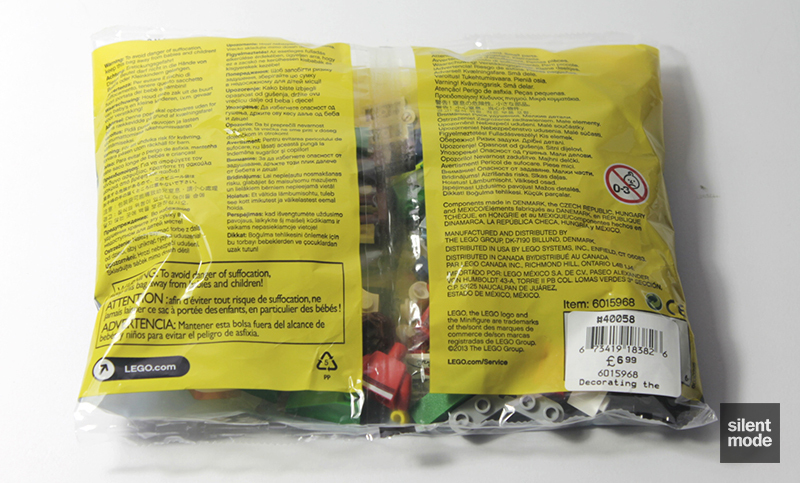 The polybag comes with everything you see in this picture, which includes some rather interesting parts. Someone somewhere will have a use for the four Technic “rotor” plates in Light Stone Grey (we’re using open database colour names now), while the Reddish Brown fence parts catch my eye – could use some of those. We also have a set of “macaroni” bricks and a 6×6 plate in White at our disposal, which is nice if you are planning a winter-themed MOC. All of these small pieces come in the smaller bag. Here’s another chance to begin your magic wand collection, with one in a very common colour, often found (along with Transparent Dark Pink) at the Build-a-Mini bar. Remember the 1×1 round tiles we went crazy over a couple of years ago? They’re back with a vengeance, this time in Flat Silver (one of the best variations). This is by far one of the best parts to be imagined, although I haven’t really made use of them as much as I’d like. Of course, there are plenty of other useful small elements to contend with, including a Green 1×1 cone and some of those Dark Green “tooth” plates. The figures included in this set are what appear to be father and daughter… or husband and dwarf wife, whichever you prefer. For safety’s sake I’ll assume it’s father and daughter, which makes it touching to see a man [able to] spend time with his child. These could very well be the same figures from Fall Scene (40057), minus the taller female; again the male has a goofy-looking grin and standard hairpiece, while the girl has a freckled face and an “Elsa/Meg” hairpiece. Besides those similarities, one could build these figures from a Build-a-Mini bar, depending on the selection. I don’t recall seeing Dark Red hips and legs, and perhaps the freckled head is uncommon, but the other parts are generally staples. Staples of the Build-a-Mini bar I mean, not actual staples. By far the biggest and most complicated thing to build in this set is the fairly big Christmas tree. 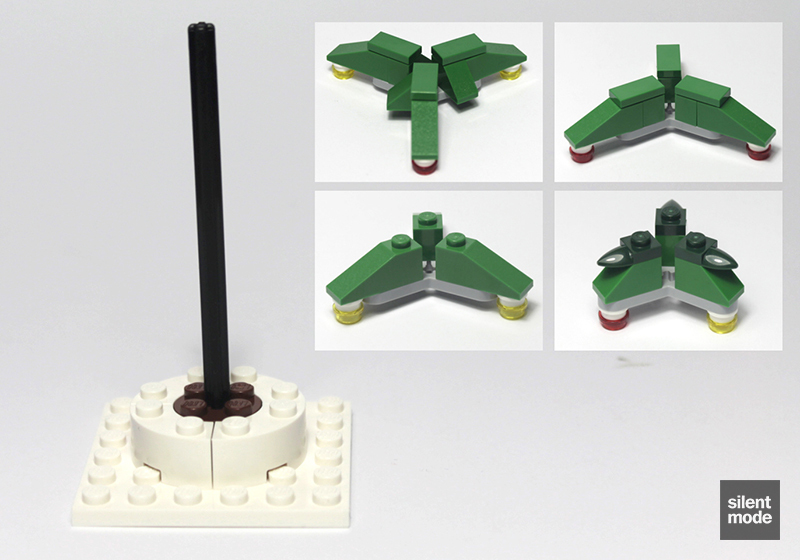 It starts off with a base formed by the 6×6 White plate and a round Reddish Brown brick with a Technic axle placed inside it, and then four tree segments are built using the rotor plates and combinations of the Green elements. It looks a lot more complicated than it actually is, but still makes for a substantial build. The end result should look like this. For those who are about to complain that the tree looks a certain way, bear in mind that most artificial Christmas trees you can buy from the shops are basically skin and bones… or rather wires and flaky bits. If anything I think that’s what this tree resembles more, and I don’t mind. The finishing touch to the tree is the Green cone with the magic wand placed inside the hole on top, which sits at the end of the Technic axle. You’re also shown how to make some gifts/presents using a few of the smaller elements, but what the instructions won’t tell you is that you’ll have to make two of the small red ones. The height of the tree wouldn’t justify using a full-size fireman’s ladder, so someone came up with the idea to use two fence parts to make a smaller one. They’re joined together using the two hinge plates in Tan; one side of the ladder is also meant to have the 1×4 Reddish Brown plates on them as well. 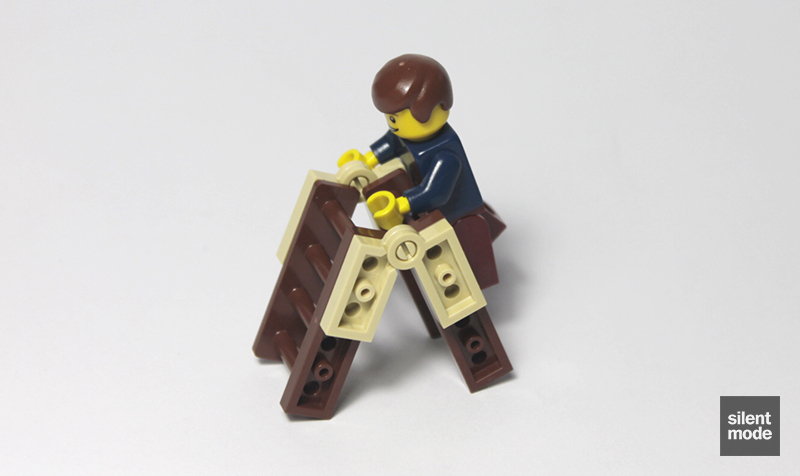 You can use the ladder folded, as shown in the instructions, or at full-length leaned against something. Placing the male figure on the ladder isn’t nearly as simple as displayed in the instructions, and requires a bit of balancing. Forget about it with the short female figure, as there’s not enough room to place the legs inside. You may recognise these builds from past Advent Calendar sets, but they’re just as welcome here. The train makes use of the “security camera” part to attach the round tiles and the rest of the elements, while the present is basically a series of plates. On top is a handwritten and wax-sealed letter from wifey. Put everything together and you have a nice-looking set that could easily be a scene on its own, or have a room built around it to be part of something bigger. The choice is yours. I’ve just realised the ladder is way too short to reach the star on top, though – with it being an artificial tree (so says me) – it could have been placed beforehand then assembled. Pretty much as expected, we have one of each tiny part in the set to play around with – but we also have a spare magic wand and two Transparent Red round plates. Assuming this set is part of the seasonal scenes theme (based on the set number), it’s definitely a step in the right direction following the underwhelming Fall Scene; even though they both involve trees, and the Fall Scene contained one more minifigure, I had far more enjoyment building this set and liked the finish build a lot more. I actually wouldn’t change much about this set, as it stands very well on its own or can be made part of a larger scene, as well as containing some useful parts for having a go at building your own models. 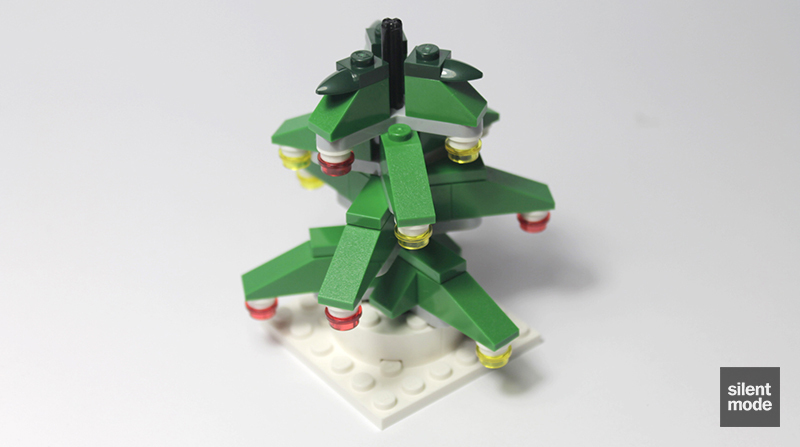 It’s a set I’d recommend for building your own Christmas tree, as well as completing the collection, rather than as a parts pack. I think it has one of the best designs for a Christmas tree, besides the Winter Toy Shop, I’ve seen in a long time. 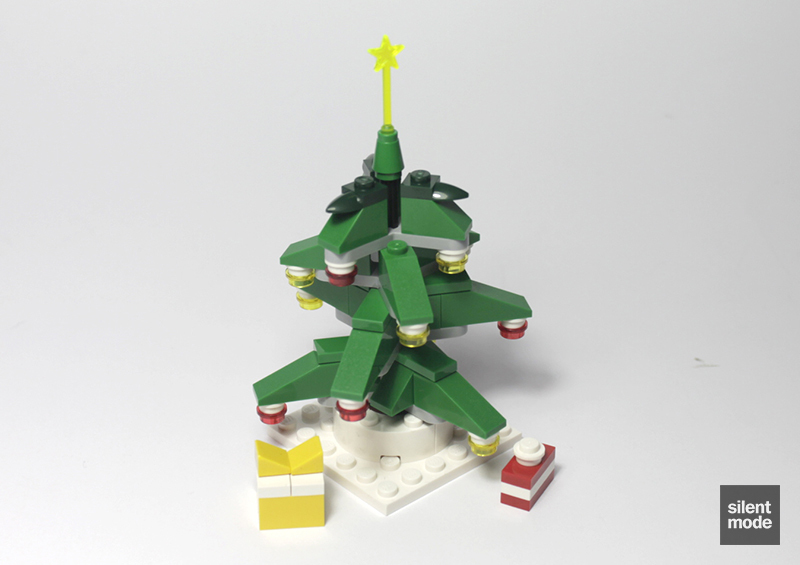 The design of the tree - the main part of the set - is a decent way of tackling the age-old challenge of how to build a minifigure-scale Christmas tree. The figures may have a basic selection of parts but can be forgiven. Having experienced the Fall Scene I was happy to have been able to build something this time! It should be an interesting build for both children and adults, and the smaller gifts are a nice touch. Many useful parts in good quantities can be found in this set, though I wouldn't class it as a parts pack. Not really a set to play with; ideally used as part of a Christmas display or a display in its own right. One to look out for if you can get any kind of discount on it, otherwise it may be worth purchasing at RRP to say you've completed the collection. So this set gets itself 7.2/10 in my book, which isn’t so bad at all. This isn’t the only winter-themed set I’ll be reviewing, so stay tuned for more!